This is a mailing label. It was designed by Karel Martens. It is dated 2013 and we acquired it in 2014. Its medium is offset lithograph on paper. It is a part of the Drawings, Prints, and Graphic Design department. When Martens is asked how much do you need to represent something, his answer is "no more than necessary." What drives his work is sparsity, limitation, constraint. 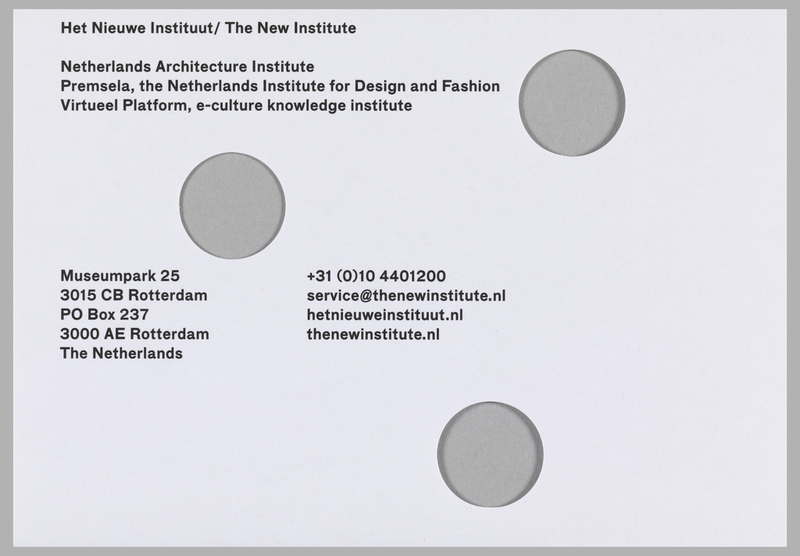 This attitude is perfectly expressed in the interim identity he designed for the New Institute (launched 2013), which combines three existing institutions: The Netherlands Architecture Institute (NAI); Premsela, The Netherlands Institute for Design and Fashion; and Virtueel Platform, for e-culture. With no money available for the intervention, Martens took the graphic identity designed by Bruce Mau for the Netherlands Architecture Institute (represented in the CHNDM collection, 2000-43-1/13) and printed over it in black, allowing enough of the old identity to show through to reveal the history behind the project, and then punched or printed three holes in the paper or envelope to represent the united institutions. As the New Institute press release stated, "With Martens’ design, history is not only visible but it is also literally given a new layer, symbolizing a new mission and ambition." From the New Institute identity campaign, Mr. Martens is donating eighteen pieces. This campaign provides a nice process story, since it demonstrates the transition from the logo material prepared by Bruce Mau to the New Institute, allowing us to see how a company or non-profit adjusts a prior graphic design campaign given a change in mission or circumstance. This object was donated by Karel Martens. It is credited Gift of Karel Martens.